It only takes 3 clicks to change PDF format to word documents (doc/rtf), images (JPG/PNG/BMP/TIF/GIF/PCX/TGA), HTML, or plain text files (txt) in batch mode with iCareAll PDF Converter. It supports file format conversion among PDF, word, excel, image txt html and more. You may drag files or load files more than 1000 files in batch mode for converting. It is 300% faster in PDF converting speed among its kind with conversion quality guaranteed. The PDF format is used extensively nowadays, it was developed to display documents in an electronic form independent of the software, hardware or operating system they are viewed on. This format preserves and protects the content and layout of a document, but their is a downside to it, as this makes PDF files hard to edit and extracting information from them is not easy at all. iCareAll PDF Converter is an efficient software application, designed to help you convert PDF files to many document and image formats that are editable. It also supports converting from other formats to PDF, and also offers to Split, Merge, Decode, and Compress PDF files. The installer size is ~43MB and the installation process is simple and straightforward. The software takes only a minute or two to install and you can run it straightaway. Just choose your desired option from the left side, add files, and start converting them. The UI is as clean as possible and has a simple layout with all the options arranged up-front so they’re easy to access. The left side contains the list of all the operation that this tool can perform like ‘PDF to Word’, ‘Word To PDF’, ‘PDF Split’, and many more. On top are 4 buttons to add files, folders, stop conversion process and to clear list. At the bottom you can change the output folder and have ‘Convert Now’ button to start the conversion process. The UI also lists all the files added and information about them too. It wouldn’t be wrong if I call this tool as ‘PDF to Any & Any to PDF’ converter. It supports a lot of conversion formats like PDF to Word, PDF to Excel, PDF to Images, PDF to HTML, PDF to TXT, Word to PDF, Excel to PDf, PPT to PDf, IMG to PDF. Moreover, this tool can also split files into multiple parts, merge files, decode and compress documents. By the looks of it, it seems obvious that this tool has been designed for batch converting a large number of files together. According to the developer it supports batch processing of more than 1000 files together. Moreover, the conversion process is fast and does not take much time at all. A few configurations and editing options would be great within the tool, it works great as a converter but that’s almost all that this tool has to offer. Preview before editing would be a good option too. On the main UI, the tool says ‘Add/Drag Files’, but I couldn’t drag and drop files to it. I had to use the dedicated button to add files. 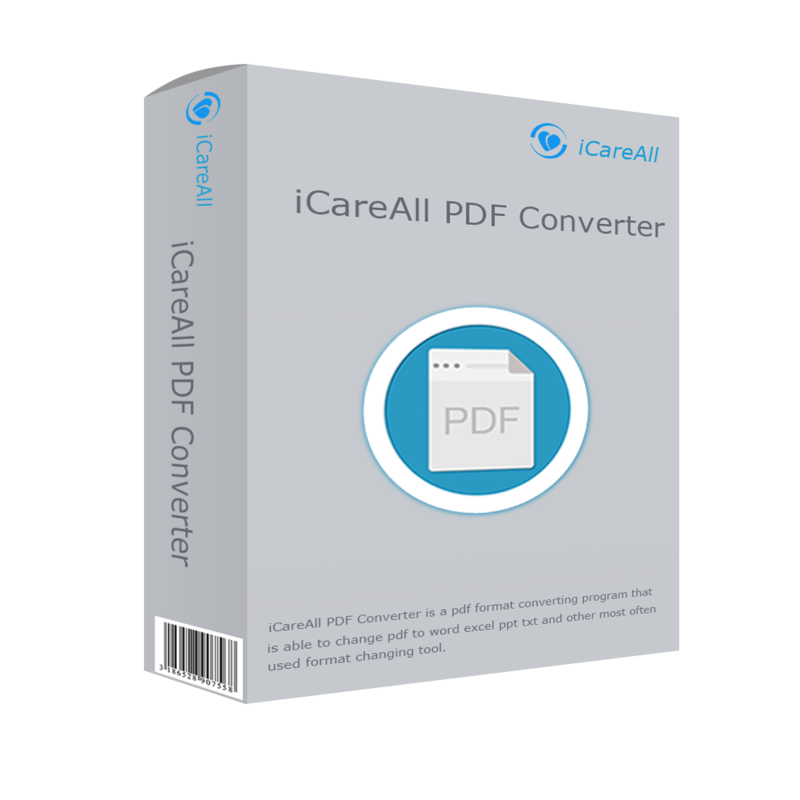 iCareAll PDF Converter is a simple and straightforward converter that supports a wide range of conversions to and from PDF format. The UI can be improved as it does not stand out much. Moreover, addition of a few editing options here and there would make this tool even better. It is recommended for those who have to deal with a lot of PDF files everyday. For a long time, one had to install multiple applications to allow them view different types of documents. The inception of document converters has brought in a change of practice. Case in point is the iCareAll PDF Converter that ensures you will not miss any PDF-related conversion. While using this program, I noted various things as highlighted below. Right from the download and installation steps, iCareAll PDF Converter presents a smooth experience. On running the converter, you will clearly see that it has it all regarding anything in PDF conversions. To get started, you need to add a file or files and choose the action you want to execute from the left side bar on the main window. One of the things that sets iCareAll PDF Converter apart from its competitors is the way it has consolidated many PDF conversion options in one place. Given the popularity of PDF files, you can easily convert them into PPT, Word, HTML, IMG, Excel, and TXT. You can also convert other file types like Word, PPTT, and Excel into PDF. The layout of iCareAll PDF Converter makes it easy to use its features. To complete the conversion process, you only need a few clicks. After the conversion is complete, a single click will be enough to open the new file or open its folder destination. When dealing with PDF files, you will quickly note that there are other manipulation tasks you need. Thankfully, you can access such features in this converter. The features will help you Split, Merger, Compress, or Decode PDF files in no time. After landing on the main window after installing iCareAll PDF Converter, its white space was reminiscent of other applications that allow users to drag and drop files. On the contrary, that was not the case with this piece of software. At one point, I thought it was a locked feature and only available in a registered copy. After registering and restarting it several times, I had to content with the fact that I had to use the Add File or Folder options. Using iCareAll PDF Converter will ensure your conversions work well without any glitches without being resource intensive. However, I missed an option or window with further settings for me to fine tune how I wanted the conversions to take place. At the same time, it does not show the sizes of the original and converted files in the file details. These aspects made the converter less intuitive than I expected. 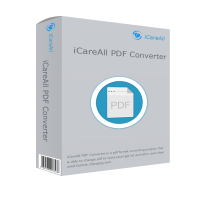 If you have been looking for a document converter especially if you deal with a lot of PDF and Word documents, then look no further than iCareAll PDF Converter. You will enjoy reliability and relatively fast conversions that depend on the size of the original file. It is an application that you can turn to whenever in need of converting PDFs into different file types. PDF and Word Documents are some of the most popular in the modern day office. Converting from one format to another has never been that much of a breeze since the primary PDF or Word Editors aren’t really interested in getting it done right. iCareAll PDF Converter is the versatile and efficient tool that does it all without flinching. I tested it on a couple of PDFs, I must admit, the results are impressive. It keeps the formatting just right, giving you the power to transform your document types at the click of a button. This is by far the biggest problem most of the converters encounter, especially when dealing with elaborately formatted PDFs with lots of graphics. iCareAll PDF Converter didn’t have any trouble with these. While the conversion speed will vary depending on the actual size of the source document, I must admit it’s still fast enough and the result will be worth the wait. You will have a wide range of conversions that will satisfy even the most dynamic of the demands. The grouping of PDF to a file format or file format to PDF makes it the ultimate conversion tool that you will ever need unless you are thinking of fancy targets/sources like Flash or HTML. Extended but useful functionality includes the split, merge, decode and compress feature. Though different from mere conversion, these features will always come in handy to someone who deals with PDF documents a lot. It would have been good news if the Decode feature was also available on other file types since they too can come encoded. The software isn’t cluttered and looks focused from the word go. It’s all about file conversions and the big menu to your left doesn’t fool you into thinking otherwise. The simplicity and straightforwardness eliminates steep learning curves making it the perfect plug and play. iCareAll PDF converter gives you no preview or editing options. All you have to do is press the convert button, close your eyes and hope that everything goes right. I would have been more comfortable with a preview pane that shows you the product long before the process begins. This will let you do last stage adjustments to avoid misplaced content, especially when converting to IMG or PPT. Simple, straightforward and light. That’s the best description for iCareAll PDF converter. It will get the job done just right and won’t bog you down with multiple optimizations and tweaks. It is a perfect ‘point and shoot’ converter for anyone who loves the speed.